"Sweeties, don't forget to bring a larger suitcase with room to take stuff home." Wonderful, wonderful words for a daughter to hear! This is our first girls weekend in about two and a half years and it is much needed. Curt's mom and sis are coming to stay with my boys and I know they will have a blast too. While I am looking forward to spending this fun time with my mama, my heart is heavy for one of my best friends and old roommate, Mel. Mel's mom has been battling ovarian cancer for four years. Next week she will have a PET scan to see if there are any tumors. If there is more than one tumor, the surgeon will not operate on her again. If she does not see more than one, Mel's mom has another chance at fighting this. Mel is enlisting some prayer warriors on her blog. If the Lord prompts your heart, please pray for Mrs. Roberson and consider leaving Mel a word of encouragement. Thanks a million! Y'all are the best. I hope you have a wonderful Labor Day weekend with friends and family. I will be back next week for a full report on the joys of eating well, shopping till we drop, and just hanging out with my two favorite women in the world. I'm still waiting to hear from Courtney and Jennifer's people about doing lunch, but there's still time! - The officer strut, especially the thought of you doing it down the aisle during my wedding rehearsal. - The beauty that you create all around you, from your perfectly applied eye makeup to the ledge above your dining table with all the cool decorations on it. And the red paisley bed spread you made that lots of us copied. Check out my sheets. - The fact that you made a onesie for Super Chicken at Middle School Camp a long time ago. - Your willingness to be an open book. - Your wisdom and the fact that you always have something encouraging to say. - Your perseverance through difficult seasons. - That the deepest dreams of your heart are very daring. - That crazy sense of humor that makes you one of my favorite people to laugh with. - You came into my life at a time when I needed a friend who understood grace. May the Lord pour out His favor on you this next year and may He make you fruitful in every single way. You have blessed my life more than you'll ever know. I love you! "...The king replied to Araunah, 'No, I insist on paying you for it. I will not sacrifice to the LORD my God burnt offerings that cost me nothing.'" Wow, next time I have a crazy day before Bible study I will remember that my offerings should cost me something. This morning I woke up and heard my phone alarm vibrating. It had been sounding silently and pointlessly for 45 minutes while I dreamed about Jack Bauer's wife and daughter finally getting in the helicopter. (I'm debating about whether to move forward with this season since they were rescued at 12:57 p.m.) I set my alarm so I could shower and dry my hair before Jackson ever woke up today, but it was not to be. I could hear him talking to himself in his crib. I got my roots done on Monday and I have been too lazy (or busy - take your pick) to dry it properly and see if it even looked good. I've had some pretty bad camp hair, but HELLO, camp time is long gone. I did manage to get my hair dried before Curt went to work, which was a miracle. Late this afternoon Jackson and I got in the car and headed out. I wasn't sure where we were going. I just knew that eventually I needed some groceries and we both needed a change of scenery. But I wasn't willing to drive more than 10 minutes, so my destination could only be the mall, Target, or the like. My gas light came on in 2.5 seconds. Dern. Then lightning began crashing all around. Double dern. So I filled up my gas tank with my heart pounding and my mind imagining the car getting struck and exploding into oblivion. Needless to say, I only put in a few gallons. We drove off and soon had to pull into a random parking lot and wait out the storm. It started to hail. Then my child got strangled on some lemonade, which caused him to throw up in his car seat - twice. And while I was searching for something to wipe it off with (a sock), he put his hands all in it. Nice. I usually keep an extra outfit in the diaper bag for special occasions like this. Ironically, today I decided I missed the little outfit I keep in there and wanted Jackson to wear it. Guess who did not replace it with a new alternate outfit? So he had to remain in the throw up clothes. Bless his heart. He was so stinky. We went to Toys R Us and got some fun new things for the little man. Then we made it to Kroger and got everything I needed for Bible study tonight. I made the Mississippi Sin Dip that BigMama posted on her blog this week. I made two batches so that there would be enough for everyone. Man, it was good and I was so impressed with myself! But college girls are plagued by this thing called competitive under-eating. Or maybe they were full from eating dinner before they came. All I know is not even one half of one batch was eaten. Oh well, I had lots of it and it was very yummy! Thanks so much for praying for me tonight. With about an hour to go, I started not feeling great. I was tired, my body ached, and my stomach hurt. So I texted my mom to ask for prayer, ate a Lean Cuisine, took some Advil, and drank some hot tea. I nearly lost it when I was eating my sesame chicken stir-fry and my child threw his little Croc shoe INTO MY FOOD. It landed IN THE BOWL. Thankfully, Curt had the wisdom to whisk him away into his room before my head popped off. I felt much better after that. The Lord brought eleven beautiful, beaming girls to my house tonight and we had us some Bible study. I might be a little biased, but it was awesome! I am so excited about this Wising Up study. The first session was so full of truth. We are going to learn a ton this semester and I'm PUMPED! -Don't live as a victim of your circumstances. -I am NOT a weak-willed woman. In Christ, I Can Operate Power-packed Emotionally (COPE). -In all your ways, acknowledge Him = know Him there. -I should want wisdom more than my next blessing. -Insight = God giving you the ability to respond in a matter when you don't have all the information. It's based on what He knows, not what you know. -Know the difference between someone who has the power of the Holy Ghost and someone who talks a bunch of God talk just to worm his/her way into your life, or into your bed! -"Seduce me - at least for 15 minutes I'll feel wanted. But for 15 months I'll feel used." -"You will never get to the bottom of the hidden treasures of the Godhead." -"Don't you mess with me. I'm different today." -The genesis of wisdom is awe of God. -Watching 24 for the first time. I rented the first half of Season One on DVD on Saturday and tonight I went back for the other half. That show is like crack. Not that I know what crack is like. But I imagine it would be something like 24. Jack Bauer may be on a little crack himself. -I made my friend Fay's Italian Biscuit-topped Casserole. It was so yummy! Maybe I'll get around to posting the recipe. -For work I am editing the Esther study that my mom is writing. It's not the official editing of course. It's just grammar, spelling, and punctuation for the Houston group that will get it before LifeWay ever publishes it. -Getting back into the groove of college ministry. Our students are back in town and we are enjoying all the energy they bring. Tomorrow night the girls and I are starting the Wising Up study at my house. It starts at 8:15, so if the Lord brings us to mind, please pray for us when you're putting your kids to bed. -I've been battling an overly sensitive spirit lately. It's not very fun because I have been getting my feelings hurt at the drop of a hat. It's pretty ridiculous, but at least I know the problem is with me and not with everyone else. I've also been really hard on myself lately. It's like I've taken every single opportunity to feel bad about ________. You name it, I feel bad about it. Can I just tell you that these issues are requiring a ridiculous amount of emotional and mental energy? Sheesh! Deliver me, Lord! From myself! -My husband started his Greek class yesterday. Right now he is at the dining room table practicing the alphabet. He sounds hilarious. And he has no idea that I'm over here giggling. I'm so proud of him for taking this class. It is not easy to learn another language, particularly one with another alphabet! 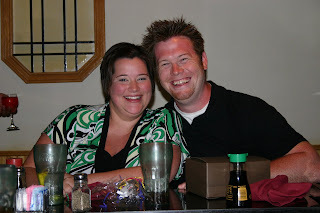 I love you, Hubs! So how do you teach a toddler, after encouraging him to throw balls for months, that he cannot also throw the wooden blocks you just bought him? They're the perfect size for grabbing and they go a long way. That's what I'm up against. We bought him the blocks after his 18 month doctor's appointment last Friday. The doctor asked how many blocks he could stack and all I could do was stammer, "Uh, he doesn't have any blocks." What kind of mother am I? My child has no blocks! We've had much fun stacking the blocks together since then and I kind of want to call the doctor and amend my answer. One thing that concerns me is what happens when the tower of blocks comes crashing down. I'm a little worried that my son has inherited my tendency not to deal well with frustration. Dern. Yesterday Jackson started his fall session of mother's day out. There was a week and a half break between the summer and fall terms and let me just say that I have gotten used to having those five hours twice a week. We dropped him off and then we headed out to Prestonwood Baptist to get some books for a seminary class Curt is taking out there this fall. Let me interject an important fact here. My idea of the perfect day is to roam around a wonderful mall with someone I love while talking about interesting things and finding somewhere great to eat lunch. My husband's idea of the perfect day is to be far, far away from a mall. Even when we go to a mall together, he likes us to go our separate ways and meet back up when it's time to leave. This is not a matter of character, rather one of preference, but it takes away much of my shopping joy. Our last Friday afternoon date included a trip to a mall, where we had a lengthy and serious discussion about our unfortunate shopping incompatibility. So I knew it was not going to be a mall day. But y'all, Prestonwood is right next to The Shops at Willow Bend. It was almost physically painful to drive by it and not go in. The thought of floating in and out of stores without a stroller sounded heavenly. A little no-purchase fall preview was calling my name. And then we took a right turn onto the toll-way and the mall faded into the distance. After lunch we separated for an eyebrow wax (me) and a trip to Lowe's (him). Later I met hubby at Lowe's (with a lovely ring of I've just been waxed redness around my forehead) so that I could help him pick out a new front door for our house. Thank You, Jesus. When the previous homeowner came by one day to see what we had done with the house, she couldn't believe we hadn't replaced the front door. It's that bad. I picked out the front door of my dreams and...Hubs said yes! He said yes! I was so excited that I wanted to call all of my friends. I have several theories as to how this might have happened. One, because I didn't throw a fit about going into the mall and therefore my husband was in a good mood at Lowe's. Two, because he loves me and knows how much joy I will get driving up to our cute little house with the cute little front door. Three, because the door he really wanted ended up being $600, thereby causing my door to look very economical. Either way, thank You, Jesus. And thank you, Hubs! I'm going to love it! I saw this on Jungle Mom's blog and I thought it was kind of fun. I received this in the form of a comment from Janelle's husband, who leads the league my husband plays in. Amanda, I loved your story. Janelle directed me to read your post…she definitely feels your pain. After reading the other comments of the “football widows”, I thought maybe I would respond not just to your story, but to perhaps share some insight from the biggest fantasy football nerd to ever play the game, to those wives and mothers who can’t understand their “boy’s” consuming need for sport. Since I’m not part of the “blogging world”, I hope I’m following all the right etiquette for posting. As Commissioner of The Armchair Fantasy Football League, in which your husband "Ghostrider" is the defending champ, it makes me proud to see the mangers of my league taking such pride in their pre-draft preparations. It is no doubt that Curtis was able to bring home last year's title because of the understanding and support he got at home last season, just as I did the year before (insert sarcasm). We (men) may not spend endless hours detailing the nuances of our day to have strangers to tell us what they feel about our stories (you bloggers are a special breed; my wife especially). Fantasy football gives us (men) a fleeting chance each year to satisfy our need for competition and strategy, our need to fight and conquer, and our need to win and just be men in the company of other men, whether in person or across town, without our man spirit demoralized by pink fluffy stuff (I love my Ella, but I feel like I live in a cotton-candy land). We get to go head-to-head each week against our friends and take every opportunity to make disparaging remarks concerning their matriarchal lineage and their inabilities to defeat you, and no one gets their feelings hurt. We test ourselves to see if we are smarter than the “experts” at Yahoo, Sports Illustrated, and ESPN, buy benching a starter in favor of a waiver-wire-wanna-be, just to because he is playing Cleveland. We test our, albeit trivial, knowledge to see if the wide receiver we took in the 11th round will have a break-out season, and you are the only one who predicted it (Vincent Jackson WR-SD). And to see if this is the year Julius Jones (RB-DAL) finally becomes the featured back he showed flashes of his rookie year, now that Bill Parcels is gone. We connect in a world, call it fantasy if you will, where we can talk for hours to each other about a subject that the mere mention of in front of our wives, mothers, sisters, daughters, aunts, or female friends and cousins, is sure to grant a deep sigh followed by a prolonged rolling of the eyes. Probably much the same as my reaction to the click, click, clicking, I hear whilst I'm trying to watch a movie with my wife and she’s posting a comment on MommyBloggersUnite...I digress. Ultimately, while watching football, basketball, baseball, (and golf when desperate), we men can sit in a room and hurl insults and sarcasm at each other all day. But thru the course of a game in those moments of victory or defeat, whether in the same room or across the world we can share a myriad of common feelings and thoughts that bond us without even saying a word. Just knowing that every Thanksgiving, my father, whom we seldom see on holidays, is watching the Cowboys just as I am, and without even talking, we are sharing the same experience miles away. And that ladies is real. Can I boast in the Lord for a minute? He has been giving me lots of joy in my household tasks the last few days. Whoever has been praying that for me, thank you! It has made such a difference. With the exception of one day, my house has been clean for a week! Tonight I was about to put The Mister to bed when I saw that our glass dining room table had crumbs all over it from dinner. (Before you call me June Cleaver - it was Chick-fil-a.) I love my glass table from Bombay Company that I begged and pleaded with Curtis to buy me while we were engaged. I'm sure I swore that I would use it forever and ever amen. Not having any money to our names back then, we bought the floor model. "Floor model" means that the chairs all had missing or loose screws and 5 years later are falling apart. At least its pretty. But there is nothing that irks me more than seeing that lovely glass surface covered with crumbs, streaks, fingerprints and water rings from our glasses. I sweetly commissioned Curtis to clean off the table while I put Jackson to sleep. A little while later I saw that Hubs was concentrating very hard on something in front of the computer and scribbling in a notebook. I was suddenly moved, thinking he must be preparing his Sunday school lesson or getting ready for the Greek class he's taking this fall. 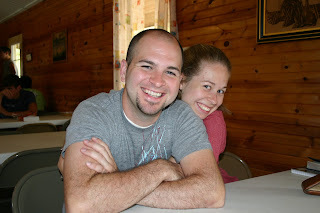 I am so blessed to have this godly husband, I thought. I grabbed a paper towel and some Windex and went to work on the table. If he was working that hard, I could certainly do this one chore for him. A few minutes ago he rose from the couch with a manly grunt. He opened his notebook to show me page upon page of research he had just done. It was neatly organized in his notebook, line by line. Fantasy football rankings, babe! By position! Here I have my quarterbacks, wide receivers, tight ends, kickers, defenses... Cause I'm gonna win again this year, babe! I know I'm not alone in this. Fantasy football wives, the LORD bless us and keep us; the LORD make His face to shine upon us and be gracious to us; the LORD turn His face toward us and give us peace. Amen. Today you are 18 months old. I'm not sure how every mother feels about this mark in time, but it seems like a big milestone to me. I've been so serious today. Even though I tried to shake it, I just couldn't smile and laugh as usual. I think I was mourning a little bit because there is absolutely nothing I can do to keep you from getting so big! Not that I'm not looking forward to things to come. I am. But I am enjoying you so much exactly how you are right now. It's not all fun and games - you do have some serious teething going on and you're experimenting with tantrums. But I just love you so much and I want to remember every single thing about you at this age. Sometimes I don't even know how to tell you how much I love you. All I can say is, "Jackson, you are Mommy's heart." I can't freeze time. I can't save an 18-month-old version of you to go back and play with when I get home from dropping you off at kindergarten. So here is what your life is like at 18 months old. When you wake up in the morning, you enjoy jumping up and down in your bed. Then I put you in your high chair and give you some raisin toast and half a banana. You watch Go Diego Go while you eat and I sit next to you having my quiet time. I do not think the Lord minds when I stop and sing the songs with you. I love how you grin at the Rescue Pack with half a piece of toast stuffed in your mouth. If I let you out of your chair before I'm done, you inevitably crawl onto the couch and try to steal my pen. That is when I call out so sweetly to Daddy to get out of the bed and come play with you. This month I've been weaning you off the bottle. You were supposed to be off the bottle at 12 months, but that is when I actually started you on one. You had one every now and then until 6 months, but at that point you said HECK NO every time I tried. I felt that nursing you for a year earned me 6 months of giving you a bottle and I do not feel one bit bad about that. You had your very last bottle last night. I held you in the glider and rocked you while you drank it. You really don't even fit in my arms like that anymore, so I wasn't as tearful as I thought I might be. Right now you like to say "What's that?" and point at everything. It sounds more like "Was da?" We are working on the words for things in your room like fan, window, chair, book, pillow, blanket, ball, dog, and bear. I think you already know a lot of it but you are keeping it a secret from me. You actually talk a whole lot, but Mommy and Daddy aren't smart enough to figure it all out yet. We could really use a toddler dictionary. You do say ball (boll) and dog (dah). You shake your head no and I don't think it will be much longer before you start saying it. When we ask you a question and you don't know the answer, you raise your hands in the air. Recently you started saying "bee bee!" or "wee wee!" when you want something. You get a really desperate look on your face and it makes me laugh. Another thing that makes me laugh is how Ella and Ava say "Mommy" so sweetly. When you say my name it is always embedded in a whine or a grunt. MaMAAAAAA!!!!! You and Daddy have a new game. 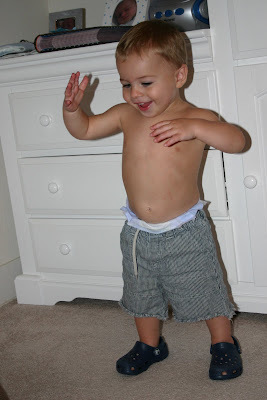 You stand on opposite ends of the room and Daddy says, "One, two, three, go!" And then you run as fast as you can to him and fall in his arms. You will say, "Uh, uh, UH!" before you take off. If I'm really lucky you'll do it for me, too. You love it when Daddy gets home from work. When you see him peeking in the window you laugh until you're breathless and go running toward him. A few weeks ago he bought you a baseball bat and y'all have had lots of fun with that. Mommy pitches to you and Daddy and y'all hit the balls together. You still love to play with balls more than anything. This month you became fascinated with spoons and forks. If a utensil is there and I don't let you use it, there is heck to pay. Sometimes (okay, all the time) it is much, much easier just to let you pick things up with your fingers. I am going to try to get better about not caring what a mess you make and how much food you waste trying. Otherwise, you'll never learn, right? Last night you fed yourself your whole dinner with a fork and you were very pleased. Son, I cannot even explain how cute you are. Your facial expressions are hilarious. 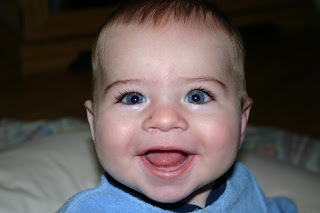 You have a silly grin that wrinkles your nose and squints your eyes. 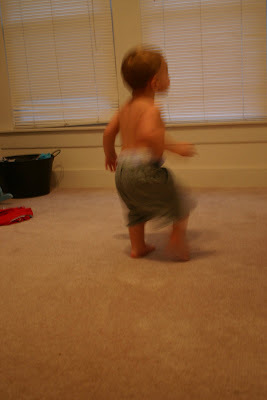 I love letting you run around with just shorts or pants on because you look like a little man. 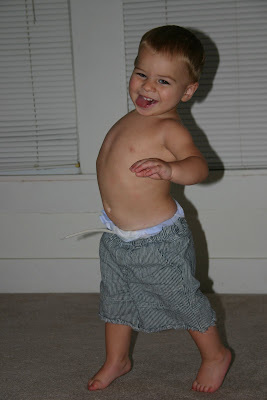 You tend to walk with your chest puffed out, which just adds to your little man-liness. Jackson Jones, you have turned Mommy's life upside down...and I have never enjoyed my life more. I love you so, so much. You are my heart. Anytime Curtis and I see kids wearing Heelys, we point and laugh at them. Not really, but they just look weird. And they just ARE weird. Until my kid wants some, and then they're awesome. 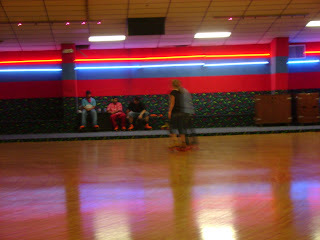 But let's be honest here - I lived to roller-skate when I was a kid. Who's to say I would not have worn Heelys if they had been around back then? After all, I did own Vans - the skating shoes of the 90's - in black, red plaid, and purple plaid. When I was a kid, my mom taught aerobics at our church's Christian Life Center. She had it goin' on in her leotards and tights, (very) big hair, and full makeup. Melissa and I tagged along with her in the summer and spent many an hour roller-skating in the gym while she taught her classes. 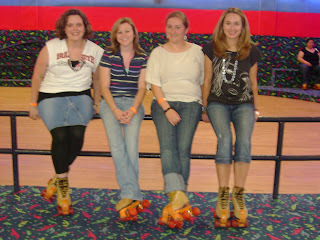 We had it goin' on in our tight-rolled jeans, our layered socks, big hair bows, and huge skates. And of course, we had mad skillz on the gym floor. We came by it honestly because in their preteen years, my dad and his sister Nalda competed locally as couples roller skaters. Is that not the greatest thing you've heard all day? I remember one year at church when my dad won a speed-skating competition. Melissa and I were so proud! At that point we had no idea the past our father had on skates. It was not revealed to us until we were mature enough to handle it. 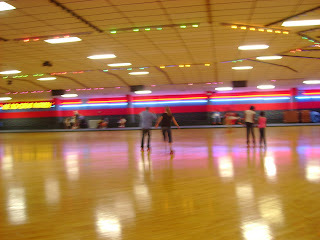 One time when I was about 7 years old, I went to the roller rink with my bff and her mom. While we were there, I ran into a boy from school who had a crush on me. In fact, I think he was the first boy who ever liked me. He used to sing "Uptown Girl" to me on the playground. 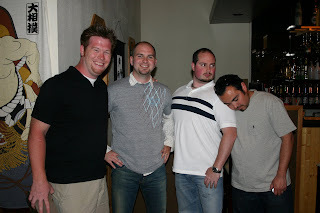 We were classmates until we graduated from high school and we had many laughs about that through the years. Anyway, that day at the roller rink I guess my pig tails were extra cute because Jonathan Wise bought me an ice pop from the concession stand. A pretty innocent gesture, right? I mean, he had to get the dime from his mom to buy it. This memory is seared in my mind because my friend's mom was not happy about it. No ma'am. "Why did you let him give you that?" she scolded. She made me feel so ashamed for accepting it. "Now I'll have to buy one for my daughter!" Fun times at the roller rink. Fun times. We went rollerskating with a few of our college students last weekend and I know you're just dying to see the pictures. Some of us wore clothes that resembled what we would have worn to the roller rink as kids. Curtis and I went on a real date afterward, so my outfit couldn't be too authentic. 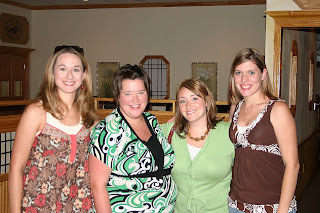 Rachael, Katy, Beth, and me. Me and my boyfriend skating together. He bought me a Dr. Pepper. And I didn't get in trouble for it. This morning I neglected to turn off the TV when SpongeBob Squarepants came on after Go Diego Go. Diego takes Jackson on "una aventura" while he eats his breakfast and I have my quiet time. If anyone is the slightest bit tempted to remind me that the AAP recommends that no child under 2 watch any amount of TV, please talk to the Lord about it. This is the only routine that has worked for me. Anyway, I was talking to my mom on the phone and making big plans for her to come stay the night with us tomorrow. Yay! I suddenly looked up at the TV and saw good ole SpongeBob...in his tighty-whities. I could have gone my whole life without seeing Spongebob Squarepants in his Spongebob Underpants. They were really low-cut, which made me think that perhaps SB might have been wearing a th*ng. Spongebob. In a th*ng. Are you disturbed? We were, too. But not so much that we didn't squeal and laugh. Mom suggested I write a post about this but advised me to KEEP AWAY FROM HER BLOG. Now that it's 105 degrees outside, I will remain in my house until October. Summer hibernation, if you will. Do not be fooled! September is not a fall month in Texas. Now that it is hot enough to fry an egg on the sidewalk, I want to shake some sense into the Gap and Anthropologie for displaying all the cute sweaters and wool skirts and rubbing it in. I have my eye on a yummy patent leather purse at Gap. Hopefully the stars will align soon and I will miraculously find myself in Anthropologie with my mom. I got to commune with their fall line last Friday and lets just say I was abundantly blessed. Now that it's 105 degrees outside and I have dedicated myself to becoming a household object, I am done slathering sunscreen on my face. Thank You, Lord, because I have had some high octane acne from my SPF 45 Neutrogena moisturizer. These things just shouldn't be! Now that my makeup melts off before I even get Jackson buckled into his carseat, I really shouldn't be making soup. But I'm craving winter white chili! Tonight's the night! Now that it is 105 degrees outside, I keep thinking, "Lord Jesus, come quickly!" Just for fun, here's a pic of my baby one year ago. Welcome to the world, Jude Kevin Simons! Congratulations, Christie and Kevin on the birth of your adorable son! 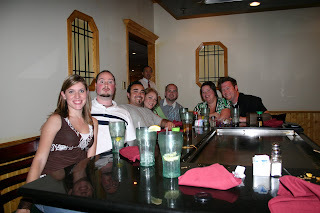 The crew got together a couple weeks ago to celebrate the upcoming arrival of Baby Jude. Highlights of the night? Xavier simply ordered some "Hibachi." Heath and I introduced Janelle to sushi and she liked it! Sunni arrived with fresh golden highlights that she had already gotten rid of by the time we saw her next. Curtis almost ingested shrimp juice and had an allergic reaction. Amanda wore a dress that she copied from Kim Soto and she's very sorry and promises never to wear it to church. Kevin socialized with all the employees who know him by name. And Christie heard more about childbirth and breastfeeding than she ever wanted to know. The two lovebirds. I wish you could see them sing a love song together. They have a great romance. Also? Kevin plays the drums the way that I am going to play them in heaven. The boys. Acting like boys. Heath did his eyes like that on purpose. Worn. Out. Mama. I've been meaning to post some pictures from our Missouri trip, but I'm worn out. My son is wearing me out. 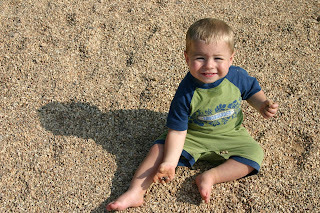 My beautiful, rambunctious, lively, smiling son, who is cutting a handful of teeth, is wearing me out. My very active, curious, great-with-his-motor-skills, loves-to-hit-his-mommy-in-the-face son is wearing me out. Teething...hitting...giving up his nap because he happened to fall asleep for fifteen minutes - FIFTEEN MINUTES - in the car...all wearing me out. He has never been more precious, and I have never loved him more, but we are at a very interesting stage. I'm feeling a little weepy. Possibly from hormones. Possibly from the flake of soap that got under my eyelid this morning. So this is all I can come up with today. *Update* I found some chocolate in my pantry and am feeling much better now. 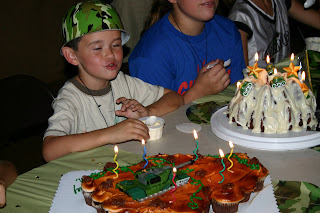 Our nephew Gavin at his Army-themed birthday party. He was joining in on his Happy Birthday song. Gavin just turned 6 and is starting kindergarten this year! 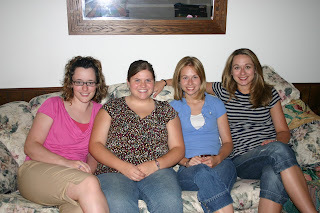 Cousin Mindy, Cousin Erin, Sister Lindsay, and me. I'm loving this picture of my boy. 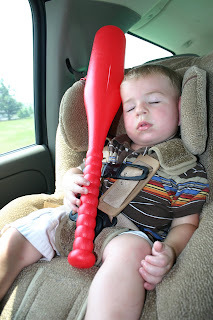 Because baseball bats are cuddly. Jesse a.k.a. 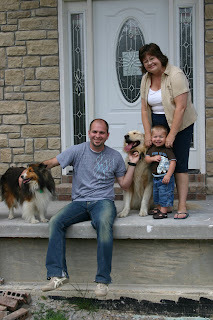 Fweets, Curt, Beckham, Jackson, and Grandma Cozy checking out progress on the new house. This is such a happy picture. I love my mother-in-law. Tonight I came across the wonderful list that Bee's husband created in honor of her 100th post. Somehow I was able to coerce my hubby into making a similar (however abbreviated) list for my - hold on, I have no idea what number I'm on - approximately 250th post. Turns out 25 is fitting! Here you go, straight from the mind of brilliant, amazing, handsome, strong, courageous, manly Hubs. 1) She has used the word “meme” at least twice. Which is at least two too many in my opinion. 2) The first week we met she wore her socks up to her knees. 3) Each of her pets have at least four names that are used on a regular basis. 5) She has toast and tea every morning. 7) She refuses to go to sleep until I tuck her in. 8) For someone who is not pro-Halloween, she spends a lot of time picking out costumes. 10) It drives her crazy when my phone alarm goes off in another part of the house. 11) She puts more effort into her friendships than any person I know. 12) She is one of the most likeable people I know. 14) She hates palm trees because of their association with men’s clubs (the bad ones). 15) It makes her mad when I watch “Grey’s Anatomy” just so I can yell at those idiots. 16) Her favorite Disney princess is Aurora (Sleeping Beauty). 17) She doesn’t like listening to new songs on the radio. Therefore, her favorite XM station is the 90’s channel. 18) She refuses to watch a televised sporting event because she is afraid that she will endear herself to one team and they might lose. 19) There is nowhere in the world she wouldn’t go if the Holy Spirit’s wind was blowing us there. 20) She asks me if there is a tornado warning every other day. 21) She has told me she thinks she’s pregnant at least 75 times in the last five years. 22) The girl loves wedding cake. Which means I can never leave a wedding early. 23) She kissed a dolphin on the lips this summer. I later killed the dolphin. 24) She’s a great athlete. 25) She’s my partner and there’s no one I would rather ride off into the sunset with. We had an awesome time at Springhill Baptist Church's youth camp - a.k.a. "Camp Ethyl." It was a very laid back camp and the grounds were much like a farm. They had an indoor gym with a volleyball net and tons and tons of balls for Jackson to play with. He got to go crazy in there when the teenagers were busy doing other things. I tried to get my husband to play volleyball with me, but I couldn't rip him away from the basketball for more than five minutes. So I pouted in the corner. I even offered to be his setter so that he could spike and show off in front of everyone. Guys love that. Y'all, it did not work! Jackson had tons of fun playing with his new friend Ethan. Ethan is 20 months old and is the son of the church's youth pastor. They got along so well! It's always fun to be around a slightly older boy so I can get a peek at what I'll be dealing with in the near future. The rate of speed at which Ethan could run shocked me. I'm gonna have to be on my toes. The highlight of the camp was the homemade water slide. It was like a giant slip 'n slide going down a steep hill and ending in a pool. Are you disappointed that I didn't say something spiritual? Well, talk to my son because he cannot sit quietly in worship or during a talk. So basically I tag along to enjoy camp food and catch up on my reading. (She's All That by Kristen Billerbeck was super cute and fun to read. I'm almost done with Bringing Up Boys.) Y'all, I'm just gonna lay it all on the line here. I hate being outside in the summer unless I'm immersed in water. It's just dreadful. One very cool thing about the camp was that Curt's sister Lindsay and cousin Erin were there as sponsors. We enjoyed hanging out with them so much. Erin even babysat Jackson so that Curt and I could go with the group on a float trip down the Current River. How sweet is that? We had the best time. Curt lost his wedding ring in the river. That was pretty sad but we will get him a new one. I had it custom made and I wasn't happy with the way it turned out anyway. I have always wanted to get something else but Curt would have none of it. So the Lord just worked it out! It will make some scuba diver's day. After camp, we headed to Springfield to spend a few days with Curt's parents. They are still living in the Harage, but their house is coming along nicely. The next time we go, we will have the huge bottom level of the house all to ourselves! I am so happy for my mother-in-law because her closet in the new house is every woman's fantasy. I almost cried when I saw it. In Springfield we celebrated our nephew Gavin's birthday at a laser tag place. Jackson nearly hyperventilated over all the balloons he got to play with. We also had a cook out with the whole extended family on both sides. On the last night we went glow-bowling at Lighthouse Lanes. It was a big night, y'all. I have always been better than most guys at bowling. I can say that without having to confess pride because it is simply the truth. Back in high school I spent a whole summer bowling almost every night with all my friends. It was then that I developed what I like to call MAD SKILLZ. Curt has never conceded that I am the better bowler even though I have proven it time and time again. So that night he swore that if I beat him, he would once and for all declare me the Bowling Master. But God said, "Curtis I have loved, Amanda I have despised," and I lost. Maybe it was the pride after all. Curt stood a few inches taller at the end of the night. I have more to say but I will save it for later. Remember how a month ago I said I had gotten a new laptop? Well, I thought I had, but it was just the printer box that had arrived. My new Dell finally got here today and it is a beast. It has a 17 inch screen! Out of control! I love it. You better believe I laid hands on this baby before I even took it out of the box and pleaded for God's anointing over it. Does God anoint computers? Someone may need to check my theology.